Together Forever will be available for purchase January 15th. CLICK HERE for further product details. Circle of Love will be available for purchase January 15th. CLICK HERE for further product details. Vintage Type will be available for purchase January 15th. CLICK HERE for further product details. 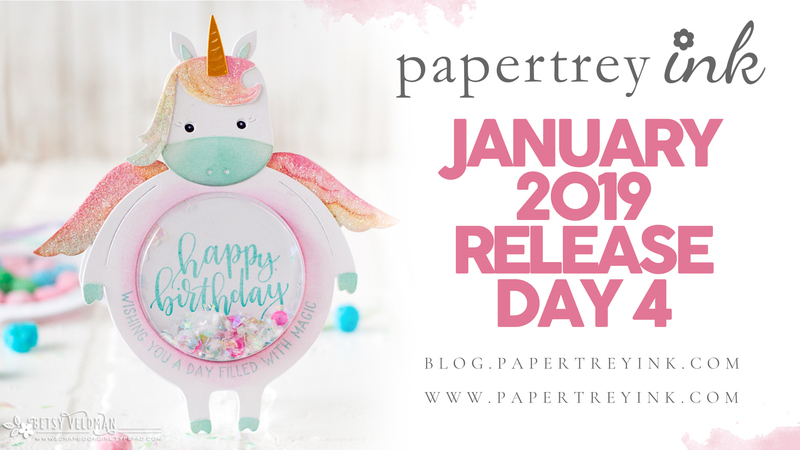 Leave a comment today and you’re automatically entered to win a $75 Papertrey Ink gift certificate! You have until 7am ET, January 15th to leave your comment and be eligible to win. Only one comment per person please. One randomly selected winner will be posted on the January Release Winners Page by 10PM ET on January 15th. To see more from Kelly Lunceford, CLICK HERE. What an awesome release! Beautiful cards! Ohh, anything with typewritten letters calls my name! The flowers are really unique and pretty too – love how funky they are. Love the together forever blooms! Ya know, YESTERDAY I had figured I knew all what I was going to get. And now THIS? Are you kidding. That circle with the flowers around it. Sigh. It’s just so beautiful. Love the Together Forever Blooms…so versatile. All the samples for all the new sets are beautiful…..and inspiring. I love these card designs. Simply gorgeous work with these stunning flowers! 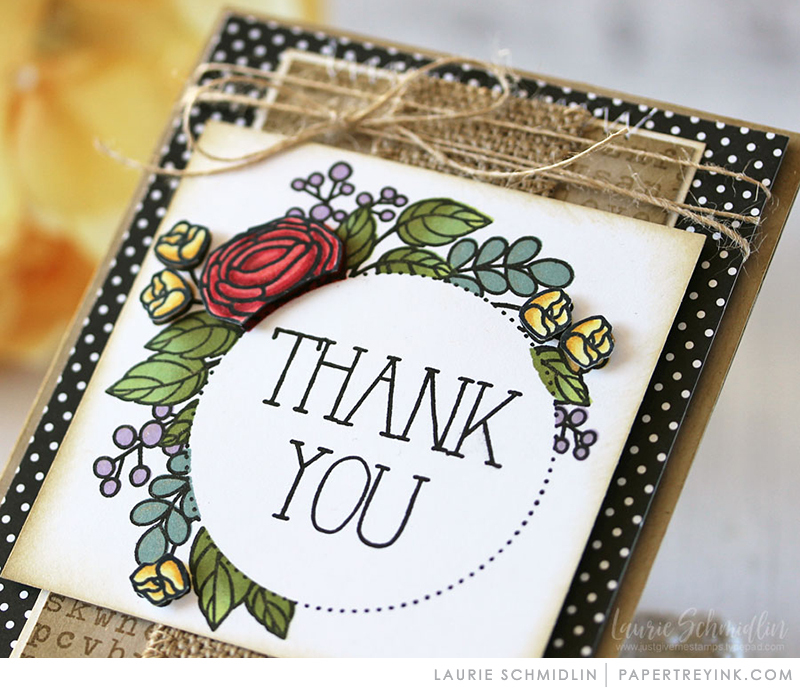 Wonderful cards today….so very beautiful! Cheers. What neat sets, it’s amazing to see all the different looks and ideas you can accomplish with them. Wow design team-wow! Lots of lovely ideas today! What lovely florals! Plus that fun vintage type-can’t wait to put these in my cart! The Circle of Love set is gorgeous! Thanks for all the inspiration and ideas. Love the flowers!! I always think “I don’t need any more flowers….” And then PTI comes up with something else that I love!! The cards are so beautiful today. I love them all. Gorgeous samples! Love the soft and bold looks you can achieve with these pretty blooms! 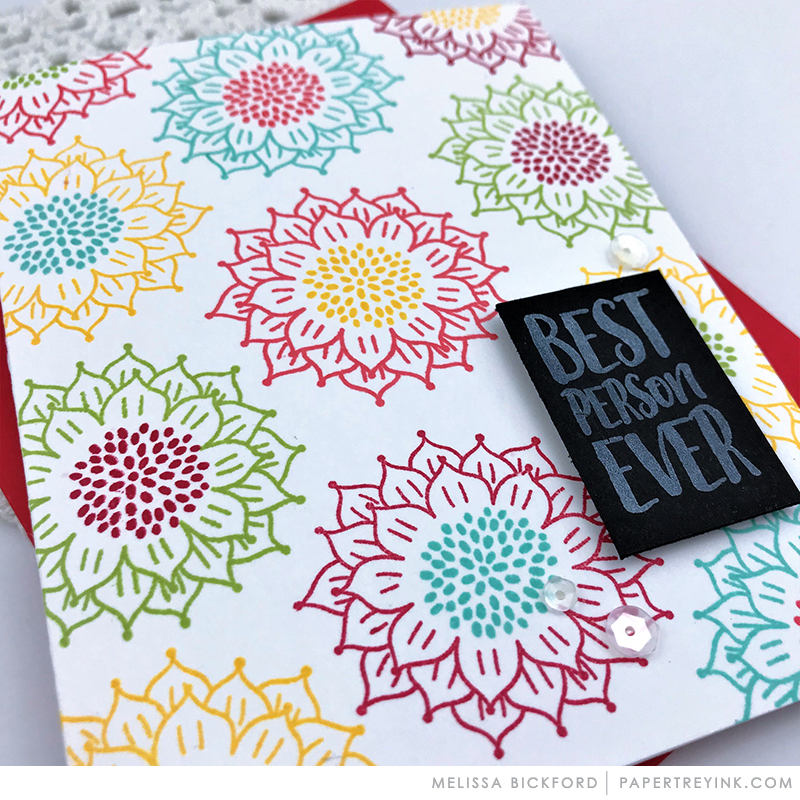 The Circle of Love makes beautiful cards! 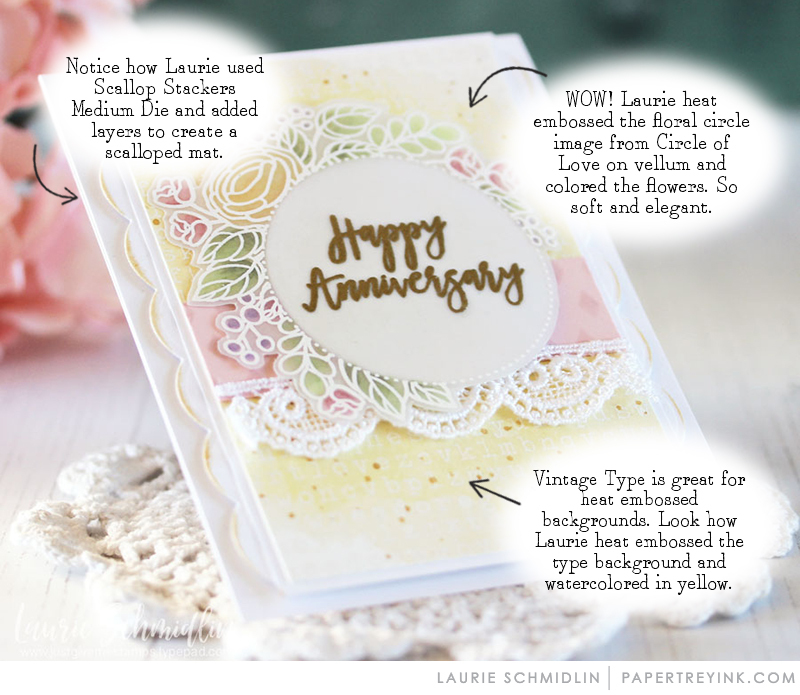 I’ll take 100 of Laurie’s yellow anniversary cards please! OMG! These are soooo gorgeous! The coloring… the embellishments! Everything is FABULOUS! Beautiful floral sets from a new PTI designer! What a fun surprise! One can never have enough floral sets. I really like all the new products today. Together Forever Blooms is such a fun set and I love the vintage type as well. I could use that on many different cards. That Circle of Love set is simply gorgeous! Cannot wait to craft with it! I love how unique the new floral sets are! Circle of Love is a must-have! Love all today’s new products – best day of the release. Lots to like with all the florals! Beautiful cards! I love so many things in this release! Beautiful flowers! I just love Bettsys smile card. I was so surprised that none of the designers chose to highlight words in the fun Vintage Type stamp….did I miss it? A quick look revealed “love,” “you,” “sweet” and “appreciate.” Are there more? I never thought I needed to add to my floral collection. Today is my favorite day of the release! I can’t wait to place my order tomorrow! Some lovely sets and samples today. I like the extra tips on the sample photos. I like the Vintage Type stamp. Love the flowers and the sentiments! LOVE the Circle of Love and Vintage Type sets! The samples are so creative and colorful! 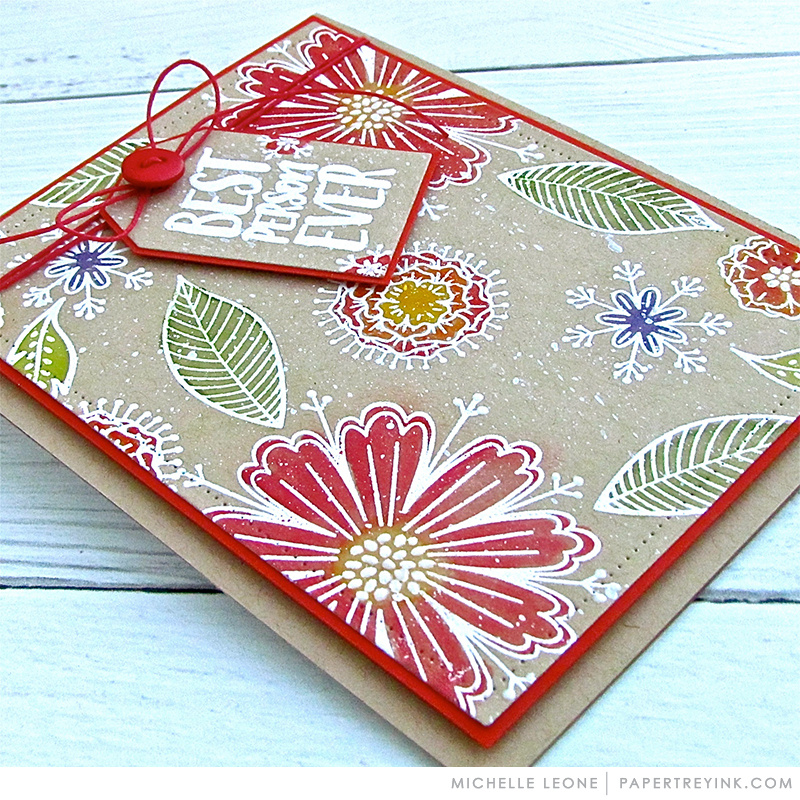 The scalloped stackers really add just the right background for the pretty stamped flowers! I really like Circle of Love, it’s such a beautiful set. Some stunning cards from the designers! Vintage type creates my type of background! Love love love vintage type! Just my style! One can never have too many floral sets! And Together Forever Blooms is a must have. Adorable and sweet cards!!! The new release is so lovely!!! Gorgeous cards!! Can’t wait until tomorrow when I can place my order! I don’t know what I love more, the flowers (gorgeous!) or the vintage type (I love anything with a script!). Absolutely stunning work by everyone. The inspiration is spectacular. Love love love the circle of love! 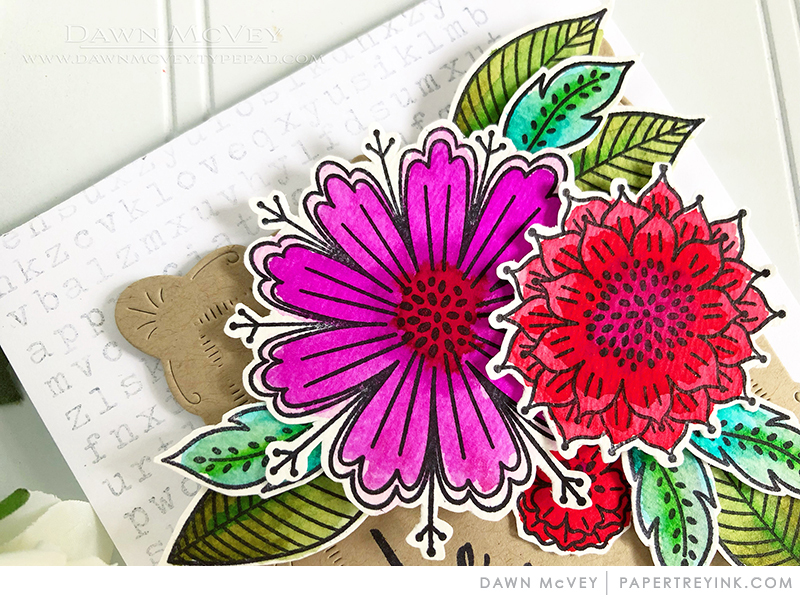 Papertrey florals are some of my favorite stamps, and now there are more beautiful ones to choose from! Gorgeous projects! All the cards are amazing. I love the designs and the colors. 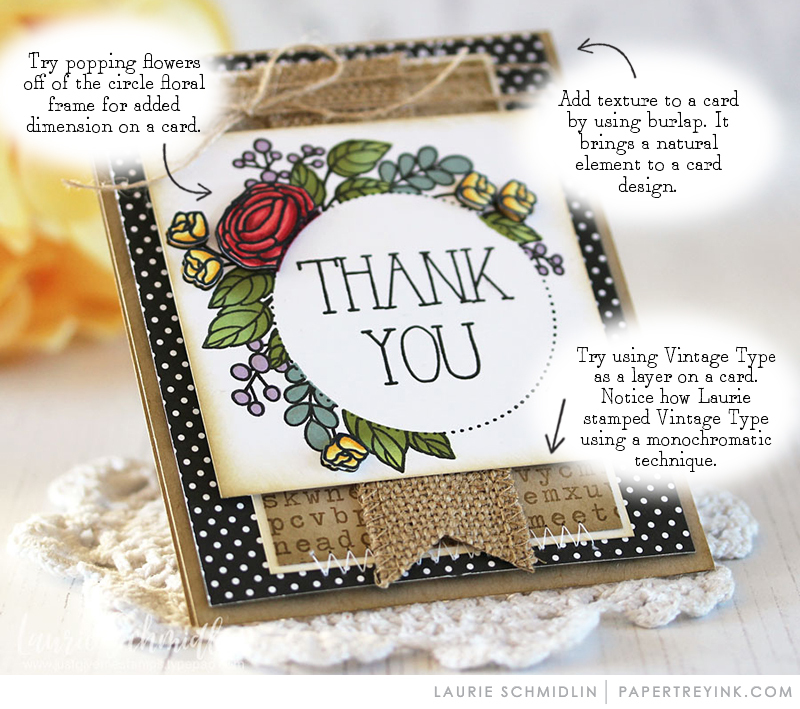 Love the Vintage Type stamp…. Vintage typewriter font is right up my alley! The Circle of Love one-layer style is brilliant! Great peeks today! Circle of Love is so beautiful! The design team did a fabulous job showcasing the sets today. Gorgeous cards today. I love all the new sets! Gorgeous!! Such beautiful samples today, totally showcasing today’s release. I love the new vintage type stamp! ❤️ This is a stamp I would use a lot! Can’t wait to get one. The circle of love is my favorite, but together forever is also great. Another day of wonderful new products, projects and design ideas. Fabulous! I love the Circle of Love set. Lovely projects today! Today is full of the most gorgeous projects! LOVE the Circle of Love!! Such an awesome way to wrap up this month’s release. The designers went above and beyond! Love the Together Forever Blooms. Beautiful cards from all. Very pretty florals and sweet sentiments in the sets today. Lovely projects by everyone. Fabulous cards & awesome release. Loving it all. wow! So many different ways to use these sets! So cool! The floral circle from The Circle of Love set is so pretty! I may just have to get that one! Wow, today’s release is so beautiful! 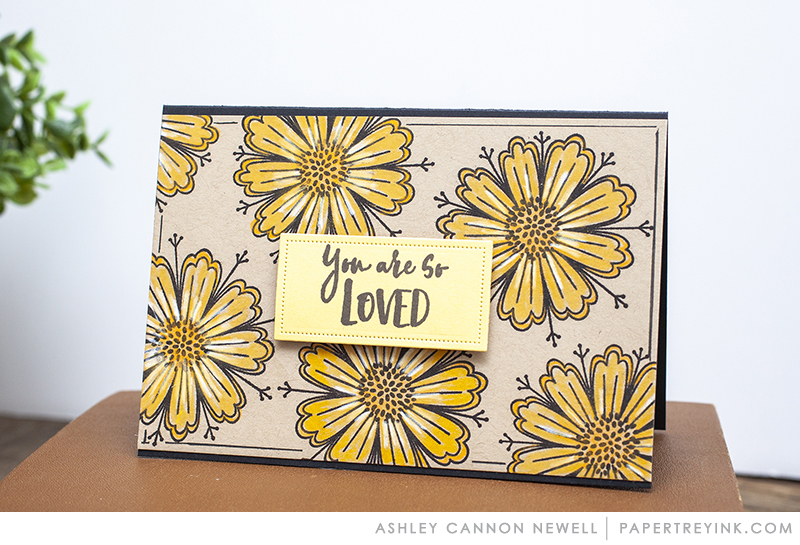 Love the florals framing the circle for sentiments. Such gorgeous samples! Love it! These cards are lovely. Great release. I love the floral frame! I visited quite a few of the blogs this morning. The cards were beautiful. I love this new format of sharing the techniques and inspirations behind each element on the card. Thank you for the daily inspiration! The two flower sets today are really pretty. I can’t wait to stamp with them. The Circle of Love is so pretty!i love all the different samples made with it, too! Great cards, looking forward to this month’s release. Beautiful! I love all the flowers, and the variety of looks from them. Today’s inspiration is my favorite for this month’s release. I never get tired of floral sets. 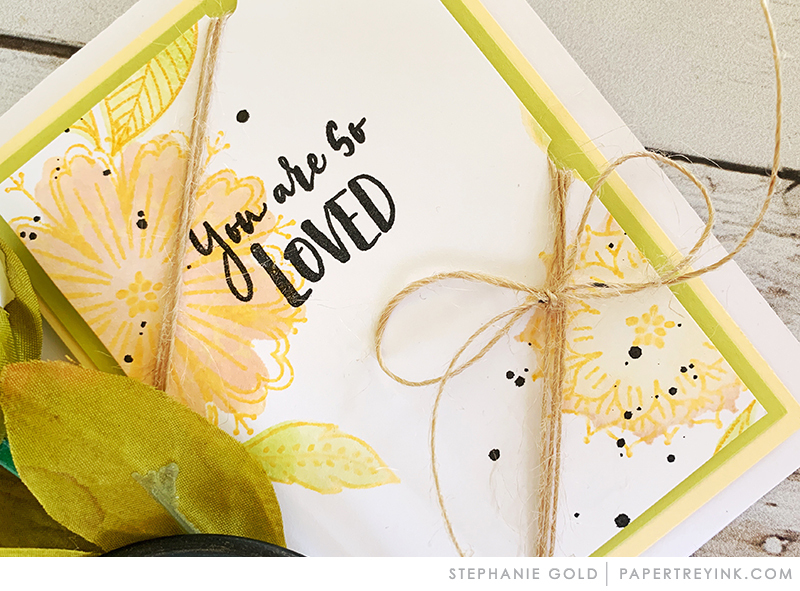 All the cards were so very pretty and I will use your very creative ideas over and over to create some standard cards as well as some beautiful notecards. Thank you as always for a wonderful release! Love the new products today. Gorgeous cards by the Design Team! Thank you! Gorgeous stamps today!! I love everything that the designers made, just Gorgeous!! Gorgeous cards! I really adore the Circle of Love set! So pretty! I love the new floral sets and that vintage type background is so unique!! It’s going to be tough decisions tomorrow night! These new blooms are gorgeous!!! And I love all of the sample projects! I am loving all the beautiful inspiring projects here today! Love the Circle of blooms set! Thank you! Love the wreath! It takes the guesswork out of floral placement and this one is beautiful. Awesome release!! I love those flowers, so very pretty. Love the vintage type background. And you can never have too may floral sets! Beautiful cards! Since I’m a sucker for florals, I’ll be getting those beautiful blooms. Such beautiful and varied designs today. Great job ladies. I love all of the pretty things! Really loving all these bright and cheery examples today! So many new products to love! Love Betsy’s circle of love card and all the designers’ cards. Circle of Love is so pretty and versatile. Love all the beautiful inspiration! Thanks! Great release and Love The Circle of Love! Ahhh …that “Circle of Love” is a must have for me ….Love it! Sooo pretty & versatile! Thank you for such creativity. The team is amazing. They really know how to get the most out of a stamp set and come up with designs I never would have thought of. I just love that vintage type set stamp, especially Kelly Lunceford’s card with it heat embossed. Especially loving Vintage Type. Great background! SQUEAL!! LOVING the NEW Products and the SWEET Inspiration!! THANKS for sharing and for the chance to WIN!! Have a FABULOUS WEEK!! Wow, more stunning inspiration projects and amazing new products! Ooooh, I love a word search! Love all of today’s product release! Circle of Love will be a favorite go-to in my collection, I’m sure. The Blooms flowers are also so very unique, and I’m a sucker for anything typed! So many beautiful samples today. Beautiful cards! Flowers are always my favorite! What pretty new florals! I’m loving all the spring colors in today’s projects. Love the Circle of Love featured today. That last review of new products was a TREAT! Circle of Love is so beautiful and was showcased beautifully by the team. 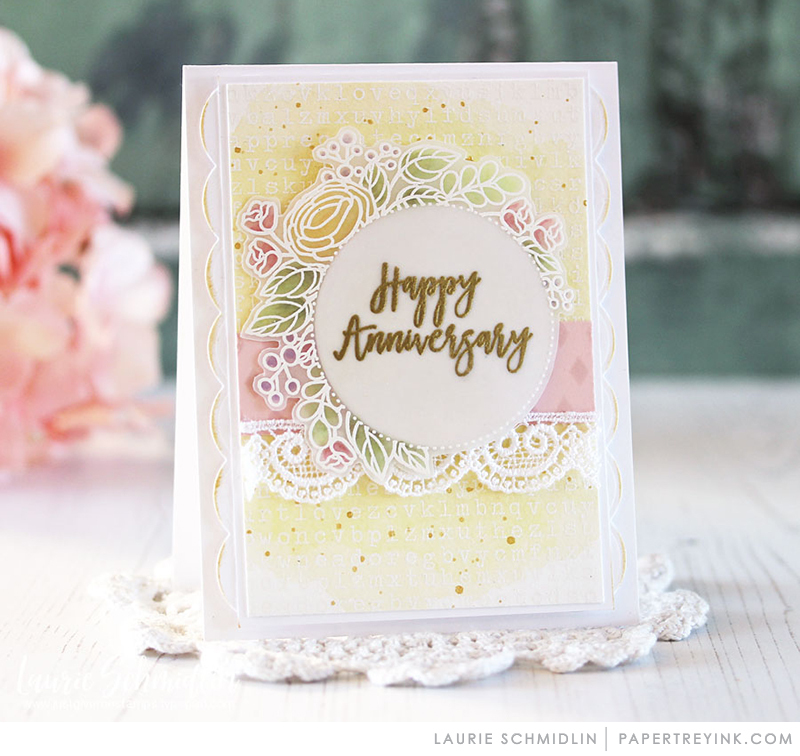 I swoon over Laurie’s soft and delicate Anniversary Card. I have always loved type backgrounds. Lovely release. I really like flowers that kind of look like snowflakes. That’s a great seasonal transition set! I LOVE both florals!!! Really love them!!! I love the Circle of Love set. Today’s projects were all beautifully done! Thanks to the fabulous DT and designers. You are the best! Love, love, love Together Forever!!!! What a beautiful mix of flowery notes! Great inspiration using so many stamps, dies and techniques! Such beautiful samples! The floral designs are lovely! Loving that Vintage Tupe background stamp. It’ll add just enough texture to a clean and simple card! I love the new flower stamps! Can never have too many flowers! Oooh I love the circle of love!!! Absolutely beautiful creations! Fun to see all the different techniques that can be used to achieve different looks from one set! I LOVE the circle of life and how beautifully the embossed flowers encircle the sentiment! The Circle of Love is just so beautiful and versatile. And the Vintage Type as a background is just so interesting. How do I pick this month? I guess I’ve just got to get them all! Oh my, today is definitely my day! I love all of these beautiful new products today. Looking forward to having some of them in my stash of supplies! So much beauty this morning…but that vintage type is my favorite! Oh, more beautiful florals. Yours are the best! What great florals and such gorgeous samples. Thanks to the team for their time and efforts. Much appreciated. The Circle of Love set is gorgeous! Love what the team did with it! Actually, I love all the products in the release today, but Circle of Love is my favorite. Circle of Love is gorgeous! Love that flower wreath! Lovely florals. But, those sentiments on Together Forever. WOW! I love the cards you have created with the new stamps! Very pretty florals! Looking forward to more of the new designer’s work for PTI! And it’s great seeing more of Ashley’s projects, too! Beautiful mix of products. Looking forward to this release. Flowers, flowers….helping to bring a touch of spring/summer to our winter! Lovely inspiration! Stunning creations using these stamp sets…I especially like the alphabet background stamp…it’s fun, edgy and the perfect font. Love these flowers! Stunning cards by our design team too! 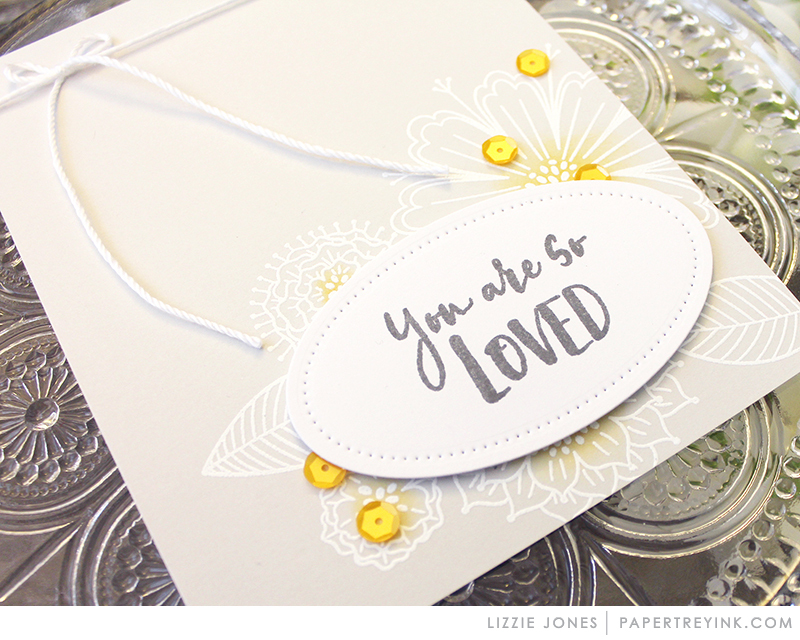 Circle of Love is just gorgeous – beautiful inspiration today from the DT! 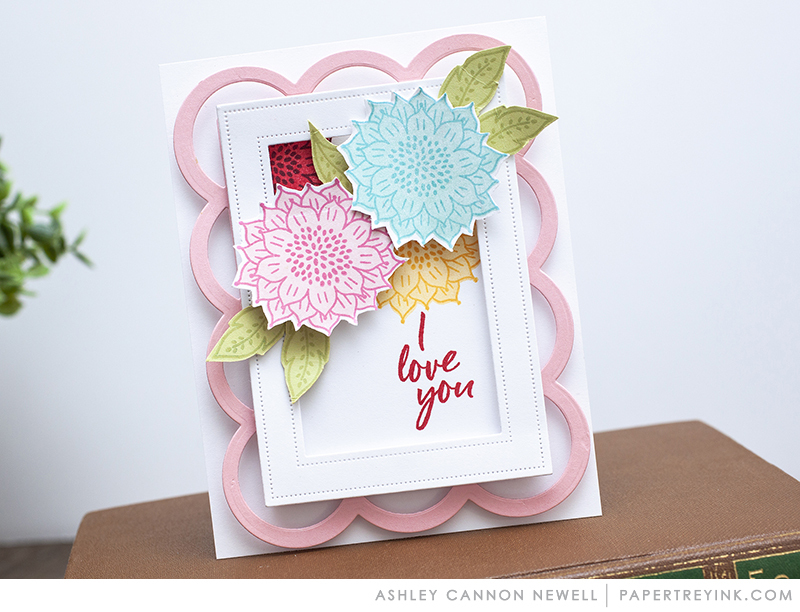 The Circle of Love set is SOOO pretty and I just love all the beautiful floral cards today! Loving that vintage background stamp too!! Another day of beautiful cards and such different styles! I can’t choose a favorite. 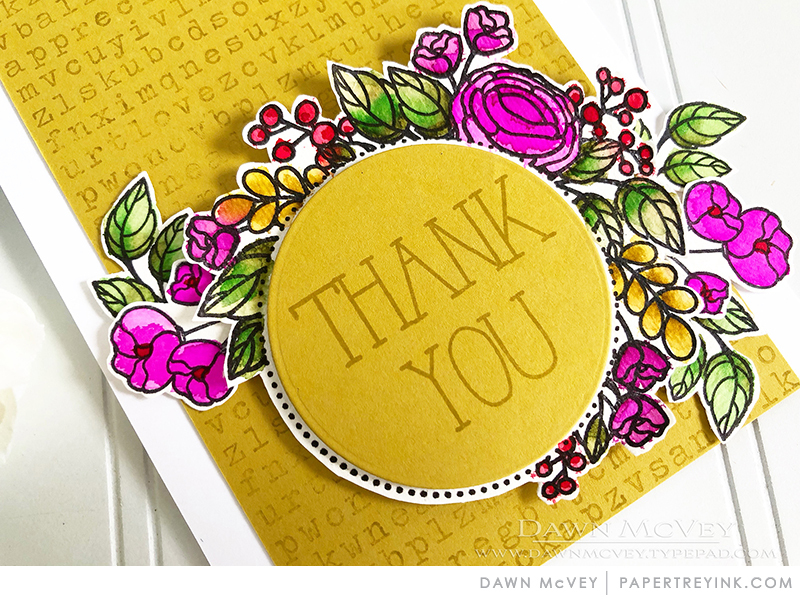 I love the vintage type stamp, so many fun ways to use this stamp. Oh my goodness! I so love everything! Wonderful release day! 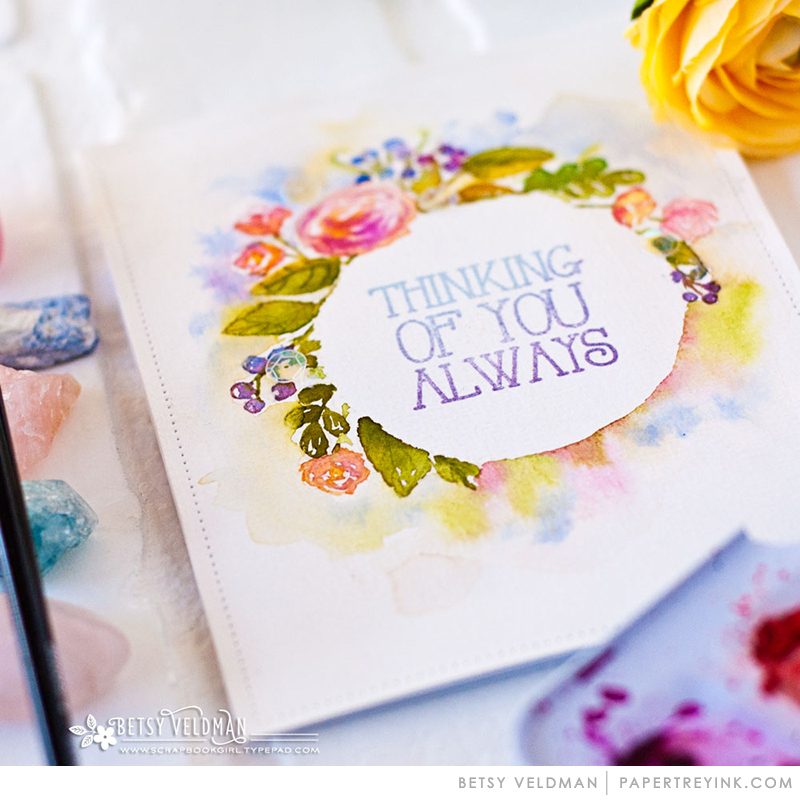 Betsy’s “Think of You Always” watercolor card is so pretty. Stunning projects showcasing these new sets! Beautiful sets & inspiring projects today! Love the Vintage Type stamp! Oh, both of those florals! One quirky and different, the other classy and easy to color. Yep, I’ll be having one of each, please. I like the new Circle of Love set and all the pretty cards made with it by the design team! These were the two sets I was most excited to glimpse in the preview, so I’m very excited to see how awesome they are in full reveal. Can’t wait! Such beautiful and inspirational pieces! Love the Circle of Love set, especially embossed in gold or white. Lovely cards today! Oh my goodness. Each release keeps getting better. There are so many set I’d love to order this month. Such great sets today! I especially like the Circle of Love set! Beautiful cards and very exciting stamp sets. I think my favorite today is Circle of Love and the Vintage Type. Love the use of Vintage Type as a very cool background. I love the circle of love!! Trying to talk myself out of Vintage Type. I do love a word search. Oy! All of the flowers today are awesome. And I really like the vintage type background. I can see so many possibilities for it! First, who is the product designer listed as Papertrey Ink? So curious to learn who “She” is since she did a fabulous job designing all of these sets. Circle of Love is my favorite of the three with its graceful lines. Because of the cost of materials used to make the product, this hobby keeps getting more expensive. I do appreciate how PTI keeps the costs down compared to other stamp companies. All this is to share that I wish there were less dies in the Circle to Love collection. (I’ve thought this before with some other die collections, but it really stood out to me today.) Based on the design of this set and seeing how it was used by the DT, I wish that the two rectangular dies were not included. I cannot see someone choosing to use those dies in conjunction with the flower circle, maybe with another set, but not this one. In fact, I would have loved to see just the three flower/leaf dies included in the collection to keep the cost affordable, at the very least lower. The word dies could have been in a separate collection, if the designer really wanted them included. All of this is, obviously, just my opinion and does not take away from how lovely the Circle of Love set is. Looking forward to seeing other designs from She/Papertrey Ink in the future. Love today’s stamps. The sizing is awesome. I’m not the best at coloring, so it’s cool that these have a look that would be forgiving. Wow – lots of great sets today! Beautiful samples too. Man alive! Together Forever Blooms… I. Love. This. Set. It’s a must have. More beautiful flowers. Lovely projects today. The Circle of Love is the best! Another day of gorgeous projects!! I really like the Circle Of Love stamp set and die! The Circle of Love set is sweet and wonderful! Love the cards made with it! More beautiful cards and great new products! So fun and amazing to see so many variations that you talented gals come up with! Love it! Wow – 3 incredible stamp sets today – great images & sentiments & an awesome background! I enjoyed the different uses for the alphabet background; and I think the Circle of Love wants to come home with me — so pretty on vellum! I’m loving all those pretty flowers! My DH recently asked me how many flower stamps I had……I said I really thought that I had plenty…..probably in the hundreds. Then I see Circle of Love…. Love all the DT samples! Beautiful new sets by Kara. Wow, I love everything today! Beautiful stamp sets and dies. Did I miss who is the designer? I think the video just said ‘she’. The design team did a great job showcasing. Thanks PTI! Loving the Circle of Love set! Wonderful, circle of flowers and circle of love set. Thanks for sharing. Circle of Love and Vintage Type are my favorites today. Love what the DT has done with them! I’m a sucker for type-face fonts. Love how it’s used in the design team’s projects. I’m in love with those gorgeous blooms! I am so loving all the cards created with the Circle of Love stamps, this set goes to the top of my list! Love today’s release! Awesome projects from the team! The DT samples today are very pretty. Well done team. Today’s products are so pretty. I love the florals and the fonts are beautiful! Circle of Love is gorgeous! Beautifully done! Another fabulous day of sneak peeks!! Those flowers look so pretty! Absolutely love that circle of love! I’m excited to see some stamps we can color! Great projects by everyone! Love the Vintage Type. 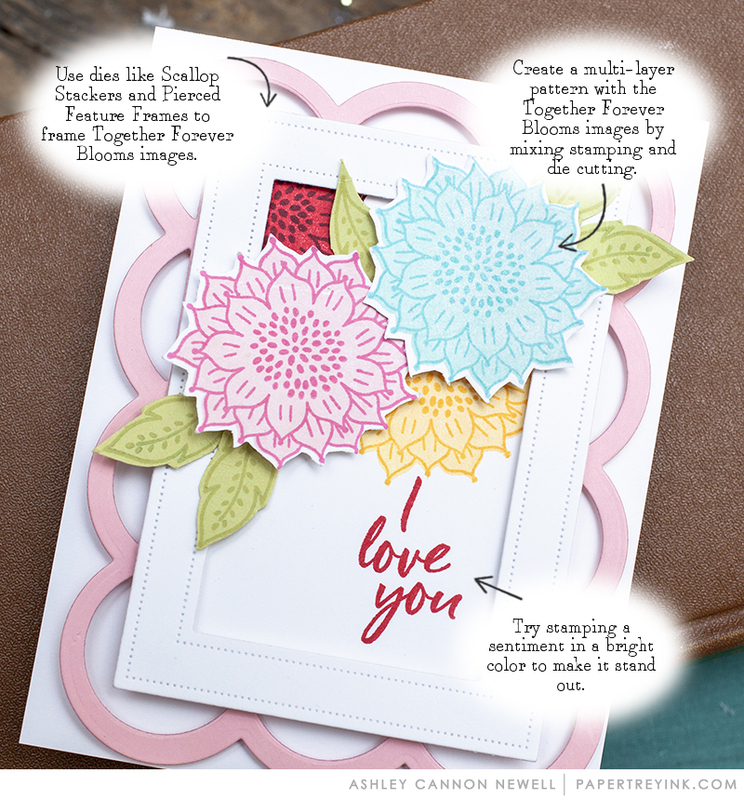 Together Forever Blooms and Circle of Love are GORGEOUS! I love all the options for giving them color! And I must have the new Typeset! Love you. Papertrey Ink! This is a fabulous release! Such beautiful cards today. What a great release! Gorgeous projects today. I especially love Circle of Love and all the beautiful ways the ladies have designed with it. 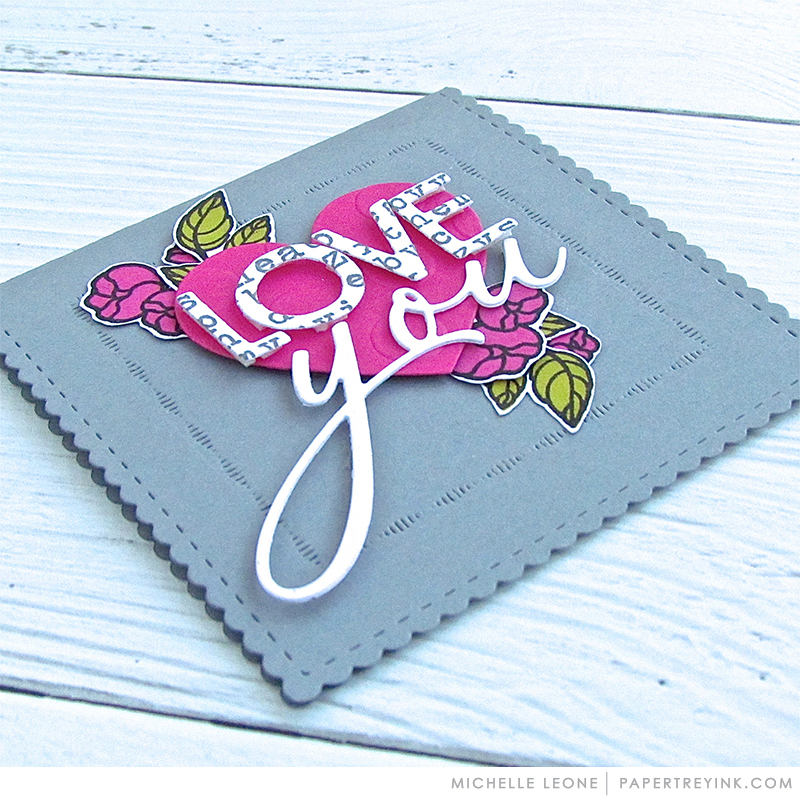 What a great release of LOVE stamps and dies! That type stamp is so versatile! It has been an amazing release – today’s cards are just gorgeous. Dreams of spring. Loving all the florals- soooo very pretty! Lovely cards! To me, leaves and flowers make the best cards. Great designs team! Oh wow, what a fabulous release, I just love everything!!!!! The vintage type background is perfect! Oh my, this is going to be tough as there are so many great releases. Today I love the Together Forever Blooms-so very pretty. Thanks PTI team-as always you create great products for us. 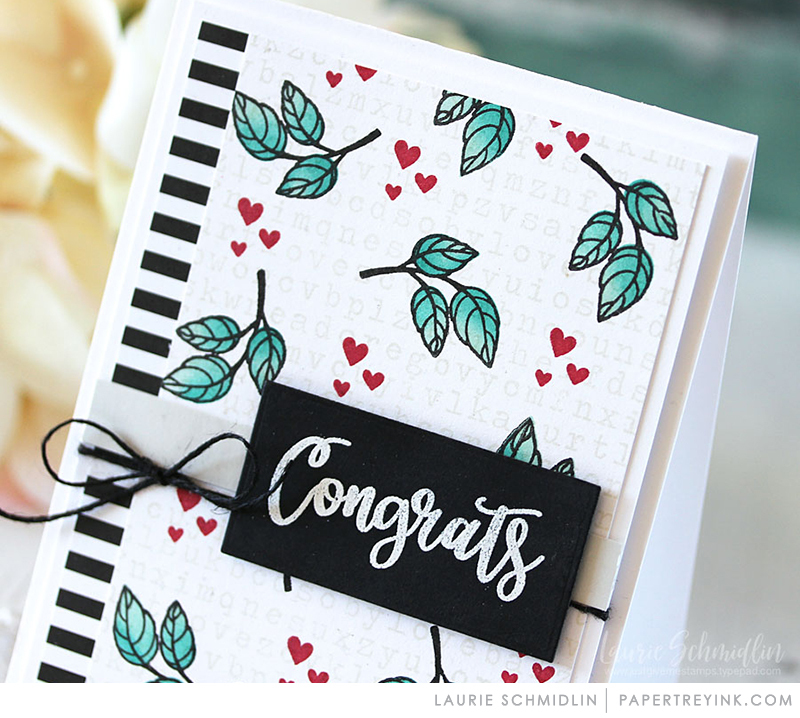 Love the together forever bloom and the type background stamp. All the bright colors are great for the Hanuart blues! Love what the DT has done with all of the new releases!!!!! Circle of Love is just the most elegant and beautiful way to frame sentiments! Love the vintage type! It reminds me of my mom’s old typewriter. 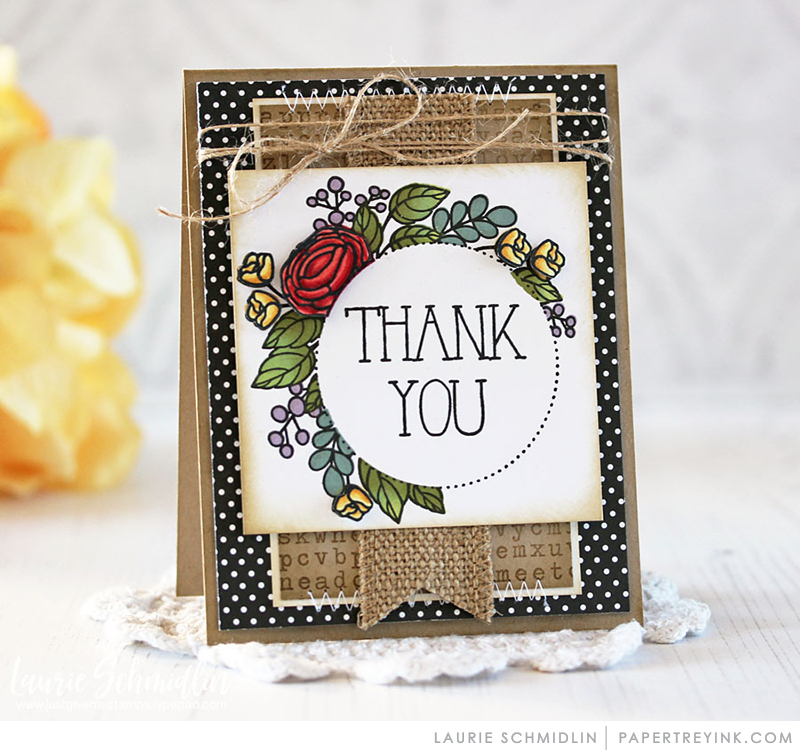 really love Laurie and Melissa’s cards using Circle of Love today! 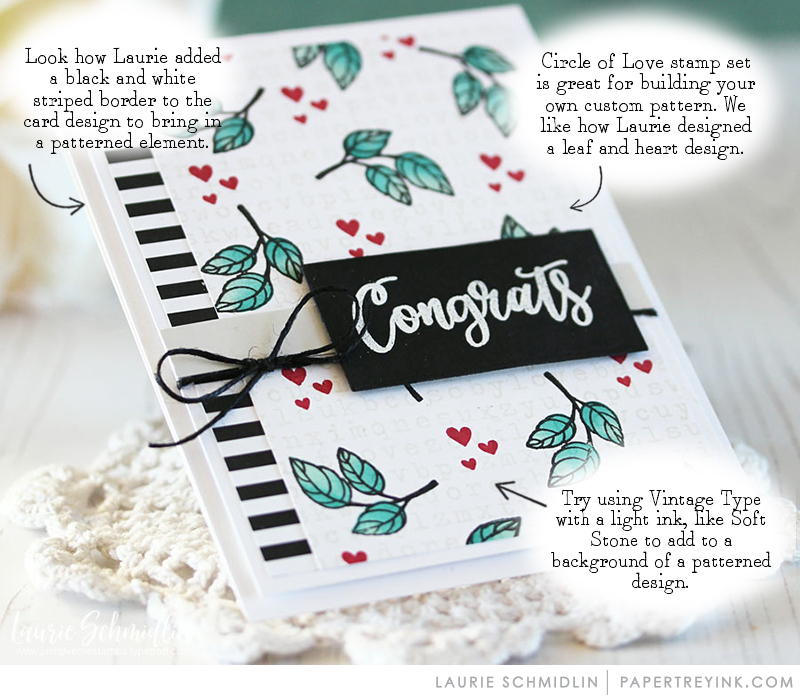 The circle of love stamps are beautiful and versatile. 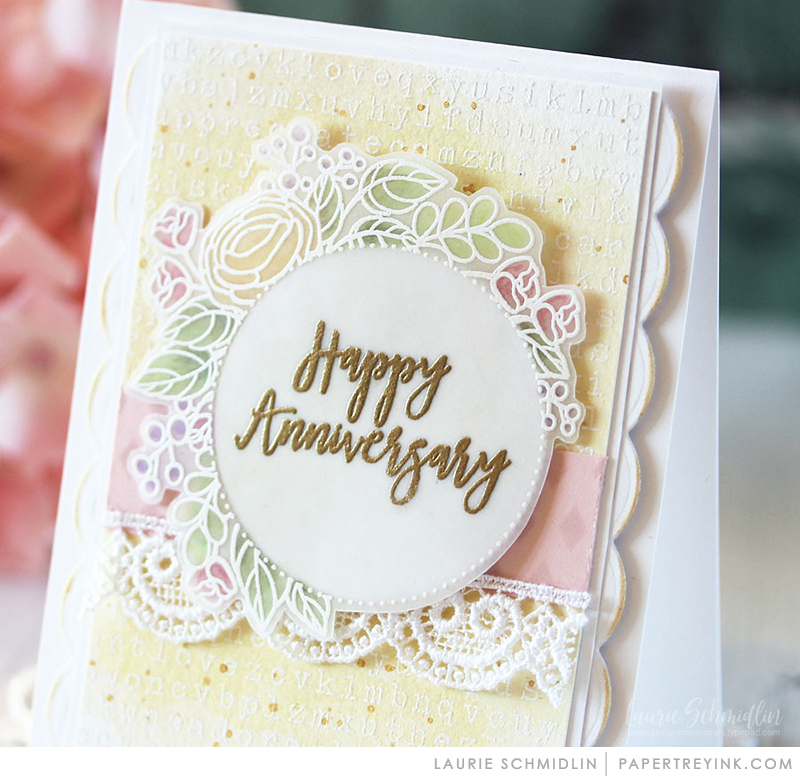 Laurie’s white embossed Circle of Love card is gorgeous. I love Circle of Love! 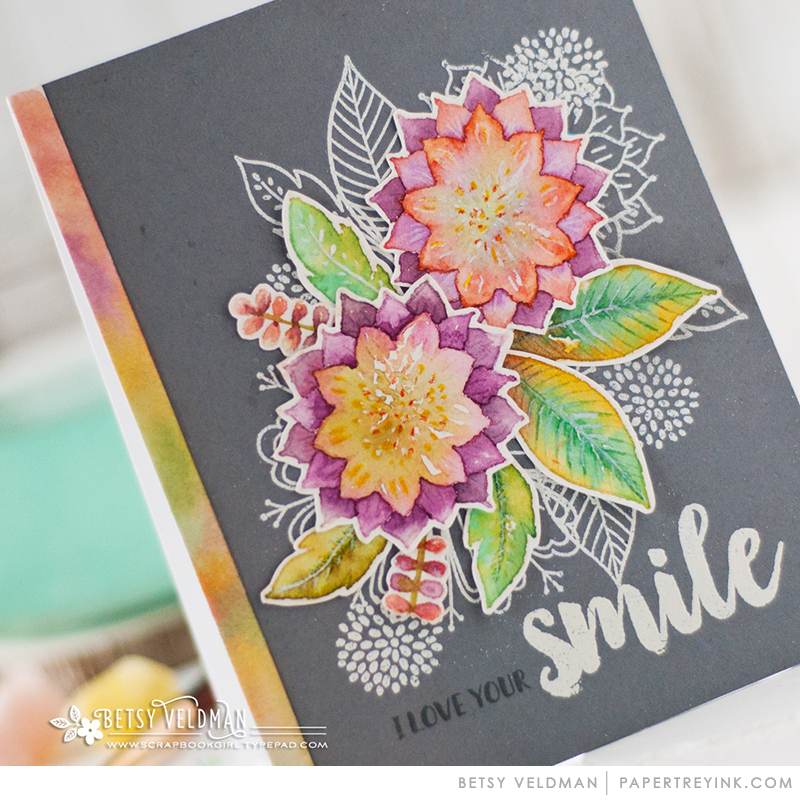 So many great projects with it, especially Betsy’s water-coloring and Laurie’s vellum. I love everything today, especially the Circle of Love! Yet another fabulous release! Love the new products and all the beautiful cards from today. Love the designs in the Together Forever Blooms set! The flowers are so versatile! 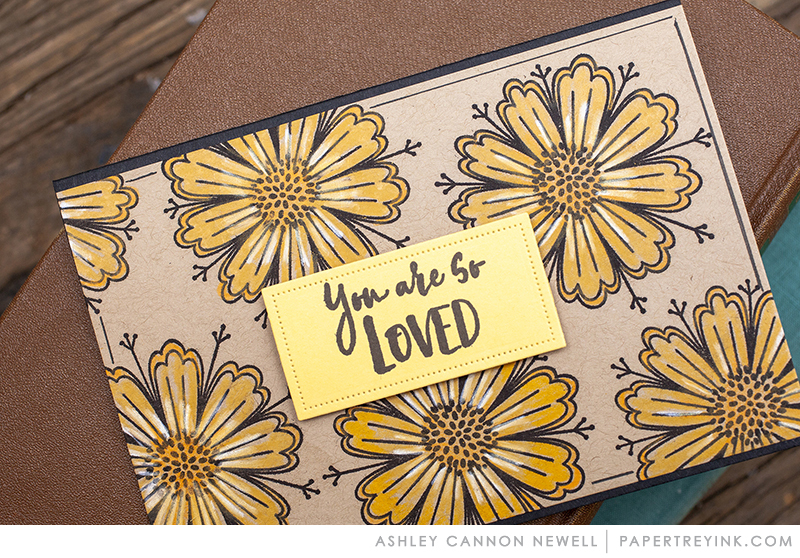 Love the floral stamp and die sets being released this month! I’m loving Together Forever Blooms! What a fun floral set! Love the floral stamp sets. Thanks to all for sharing their projects and inspiration. Love the release presented today and the teams samples are very much to my liking. I’m really liking the Together Forever set! I love the release today . The ideas from the design team are very much to my liking. I had myself convinced I did not need another set of flower stamps/dies! Well, after seeing the gorgeous cards from the DT, I have changed my mind! Together Forever and Circle of Love are both beautiful floralsets! So many lovely ways to use flowers! I love the Forever Together Blooms. I especially like Betsy’s watercolor card that really shows them off. Beautiful sets and projects by all! Such pretty cards from the design team! Love the Together Forever set!! Fabulous creations! Love that circle – so pretty! Love all the wonderful inspiration from the PTI designers! Keep it up ladies. Gosh, every single card is so beautiful. I want everything. Such lovely cards and colors. My favorites for today are Circle of Love and Vintage Type. Another day of wonderful creations! There is so many wonderful things to admire today!! Love that wreath and the Vintage Type. 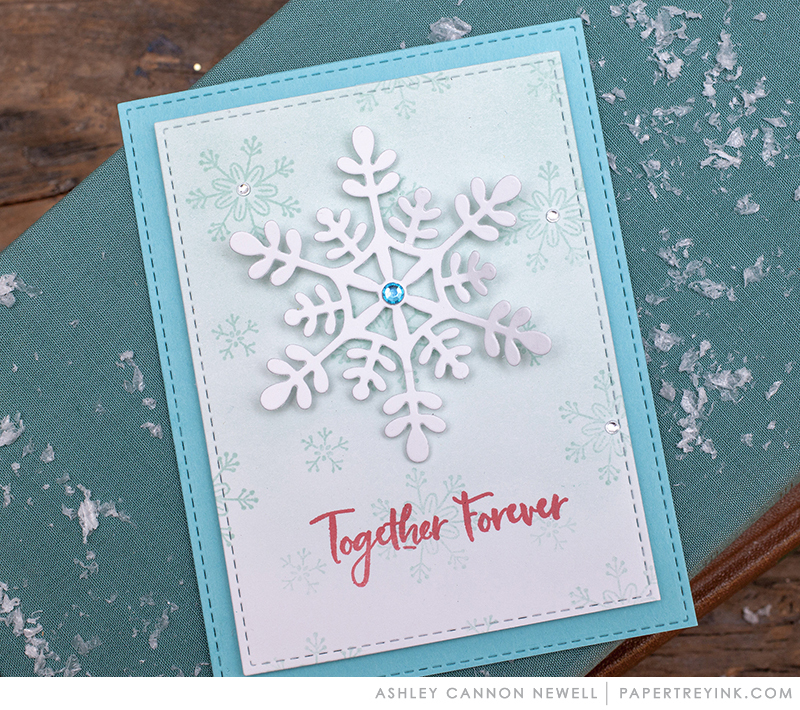 Especially loving Kelly’s card with all the embossing and color combo! I’m just loving together forever blooms and circle of love! What a Fun typewriter type. What an amazing release, and the designers… stunning as always! Beautiful examples today! Hope we find out some details about next months anniversary festivities. Love the versatility of the Together Forever Bloom set! What an awesome release! So many new wonderful things that I NEED! There are so many stamps in these two sets that the combinations are endless. Just think of all the cards I can make. Wow! All of these floral cards are so pretty! Bright colors or soft pastels…they’re all gorgeous! Thanks for sharing the inspiration! Love the new Vintage Type stamp! Love the range in the together forever blooms and the wreath is gorgeous. So much to love in the January release. Such pretty floral sets today, and I am liking the vintage type as well. Always such amazing inspiration! I’ve been waiting to see this sweet set and is does not disappoint! Gosh, I can’t wait to get it! Very pretty stamp sets and beautiful cards!!! Love both new floral sets! Yay! There’s something special about each of the new stamp sets today, but Circle of Love has my heart! ALL of todays cards are stunning! I love all the color combinations. Beautiful cards! Love the simplicity of many showcasing the new sets! Fabulous release! Love the floral frame and pretty snowflake. Gorgeous work by the DT!!! Love the Together Forever and the Circle of Love! Thanks! Love the card ideas today. Thank you for the inspiration. Gorgeous products again today. I particularly like the vintage type and circle of love. Fantastic release! Lovely floral images… I’m a flower girl and use flower images most of the time I craft. The vintage type is awesome! Great samples ladies! I am SO loving everything in today’s showcase. Beautiful! The vintage typo looks like a must have. Wonderful new products today, and great inspiration from everyone. My wish list is growing! Seeing all these flowers reminds me Spring is not far off. Some beautiful designs showcased today. Loved the DT’s projects, so pretty! 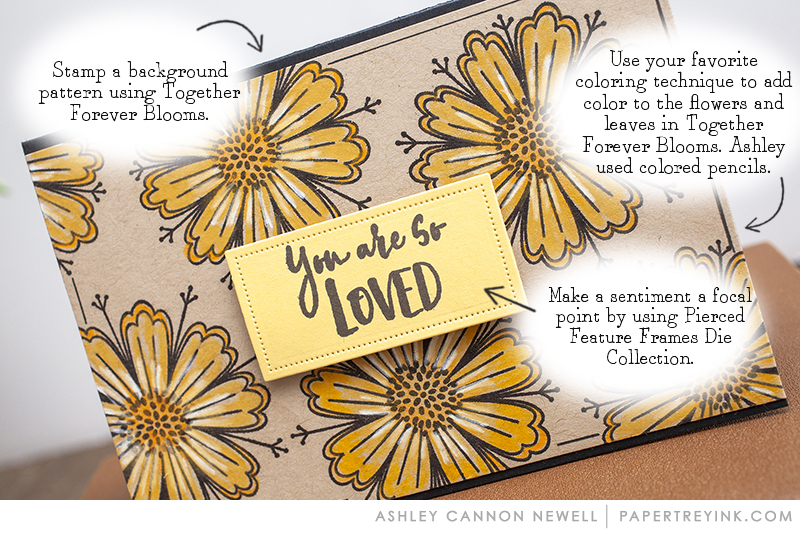 Gorgeous card designs for the Circle of Love stamp set! Circle of Love and Type BG stamps are my favorite. Day 5 is so cool with all the different mediums! Betsy’s water coloring and Ashley’s colored pencils are both beautiful and I love the embossed vellum! I too would like to know who “She/PTI” is – beautiful designs! Together forever blooms is such a lovely stamp set. The design team came up with some great designs with this set. Love the release. Great inspiration. Lovely projects today, PTI Design Team! I particularly enjoy the Circle of Love … so pretty! Thank you for inspiring. Really lovely stamp sets and I love all the beautiful cards and project ideas! Love all things floral! Gorgeous artwork ladies! Always inspirational! Once again, everything is amazing! Love the vintage type, very cool 😎! The Circle of Love stamp set is so pretty! Lovely release! This release has so many gorgeous products! How can I ever choose? Really love the Vintage Type background stamp! Beautiful cards! Floral sets are my favorites! Circle of Love is my favorite of today’s products. The flowers are simply gorgeous and I love seeing all the examples from the design team! They did a terrific job! All of these new stamp sets are just gorgeous. They remind me of Nichole’s graphic style, which I have really missed. Together Forever Blooms is a beautiful set, Vintage Type, too! Thanks for the chance to win a gift certificate. I absolutely love Circle of Love!!!! I’ve seen so many projects shared today on Instagram and all you pretty much have to say to me is “watercolor” and I’m sold! This is gorgeous and definitely on my wishlist! Thanks so much for all the lovely projects and products! I love the ideas the design team gives us with each release. Such talented ladies who showcase many different techniques! Love everything in this release! Such beautiful and fun inspiration by the designers too! The design team has done such a beautiful job once again with amazing new products!!! Today’s projects are beautiful! The design team does such a great job month after month. Beautiful release! The Vintage Type Stamp may be my favorite. So versatile! Florals sets are timeless, also love the graphic time set. Lovely cards. I am super excited for this release and ready to shop! Amazing inspiration from the design team, you are so incredible! I really like the Circle of Love set. Always looking for ideas for anniversary cards. So many gorgeous creations in this release! The DT has outdone themselves. That awesome Vintage Type background is truly special & I can’t wait to make some backgrounds with it! Great projects by the team. I am eyeing Circle Of Love. So many uses for it. The DT does it again making me want it all. What a great release! I’m loving the new Circle of Flowers set today! 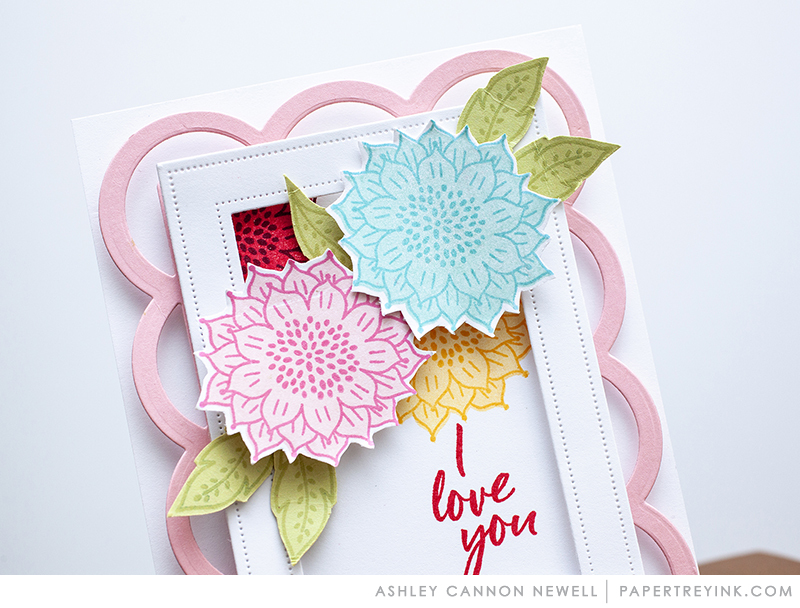 Circle of Love is so pretty – love all the different ways the team has used it! 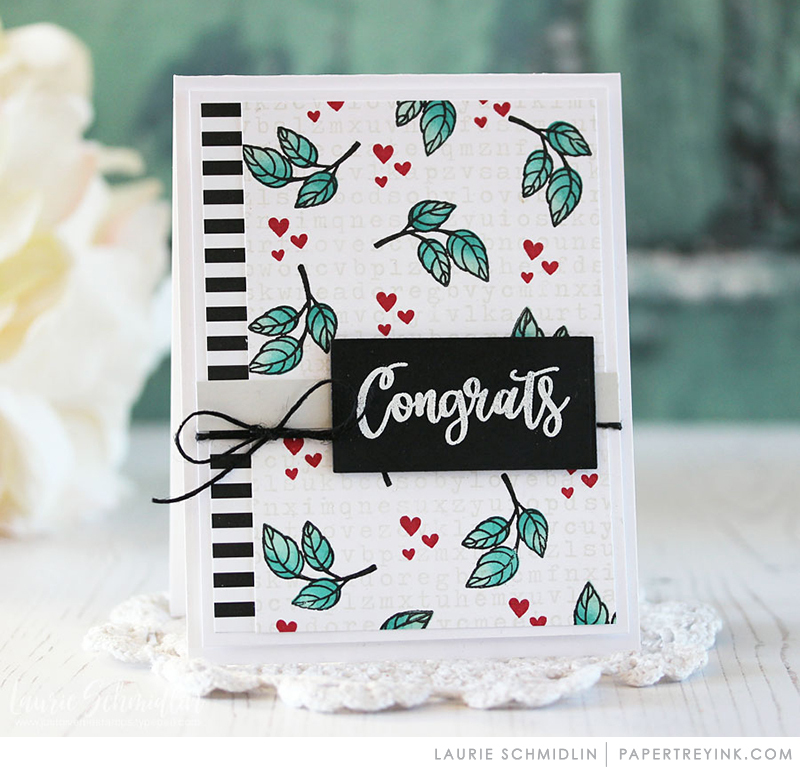 I love the new Circle of Love, and especially adore the two cards that Laurie Schmidlin created with this fabulous image. Well done! So much inspiration… can’t wait to play with these!